Official Football Manager Hints and Tips which are applicable across both the full FM PC game mode and FMC. 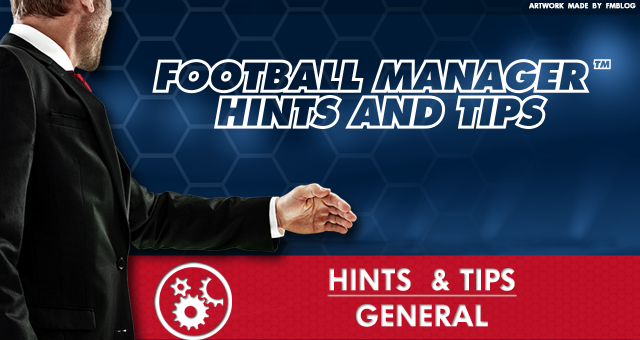 Let's take a look at General Hints and Tips for FM. When choosing your captain, the most important attribute to consider is his leadership. A player with a high penalty-taking attribute is likely to be a good choice to take your spot-kicks. With the right guidance a youngster described as a 'Wonderkid' could become a world class player. Withdrawing a player from international duty with his national team may adversely affect his morale, or worse, cause the player to dislike you. Rejecting a job offer from another club will improve your popularity with your club's board and the fans. Players with high adaptability are less likely to get homesick as they are better able to adjust to new countries and cultures. Teams in a strong financial position who consistently fill out their stadiums are prime candidates for stadium expansion. The board may decide to build a new stadium if you don't own your current ground or if you are unable to expand it further. Sending youngsters out on loan is a great way for them to get competitive match experience. When a player has just returned from injury it's a good idea to build his match fitness up through reserve fixtures and then slowly reintroduce him back into the first-team. The ratings for reflexes, handling, communication, jumping and positioning are generally a good indicator for how good a goalkeeper is. If you're looking for a good wing-back pay special attention to an individual's positioning, tackling, stamina, pace and acceleration. Positioning, tackling, pace and anticipation are just some of the important characteristics that make for a good full-back. A good centre-back will usually have high ratings for tackling, jumping, positioning, heading, strength, marking, bravery and team work. Pace, dribbling, passing, off the ball, creativity, stamina and crossing are just some of the important characteristics that make for a good winger. Passing, off the ball, creativity, technique, dribbling and stamina are just some of the important characteristics that make for a good attacking midfielder. A good defensive midfielder will most likely have high ratings for tackling, work rate, stamina and positioning. Pace, acceleration, dribbling, technique, finishing and off the ball are just some of the important characteristics that make for a good pacey striker. Jumping, heading, strength and off the ball are just some of the important characteristics that make for a good target man. The better a physio the more able he is to accurately predict how long a player will take to recover from injury. When a player is outraged over something it can indicate that he is quite temperamental and maybe has a low level of professionalism. When a player is worried or upset over something it can indicate that he doesn't handle pressure very well. Be wary when declaring an interest in another job. Your current employers may not take too kindly to you casting glances elsewhere. You can increase your popularity with your club's board if you deny speculation in the media that links you to another job. You can improve squad morale by winning football matches or rewarding them with new contracts. You can damage a player's morale if you continuously make offers for players at other clubs who play in the same position. Be careful when asking an injured player to take an injection and play through the pain barrier for a game. There is a risk that you may upset him so save these instances for really important matches. One of the best ways to ensure you do not run into debt is by keeping an eye on your total wage budget. The board will be more appreciative if you stay within the limits set. When managing a low profile club, arranging friendly games during the pre-season against high profile teams is a great way to boost your club's finances through additional gate receipts. Having players in your squad who list one another as favoured personnel will generally benefit the team. When negotiating contract terms with a player, you should consider how additional bonuses may impact your club's finances. When setting club competition bonuses, a higher bonus is likely to motivate your players more, but be careful not to stretch the finances too thinly. Sometimes placing a left footed striker in the right attacking slot increases the chances that he will score goals. Swapping strikers also makes them hard to man-mark. When consulting your Groundsman over pitch dimensions, it is important to keep in mind how your team plays. Having a wide pitch may suit teams that play with wingers whereas it may have a detrimental effect on a team that plays narrow and through the middle. It is possible to make a player 'Available For Reserve Squad'. This could prove useful for players in your first-team squad who are just on their way back from an injury lay-off. You will often be asked by your reserve team manager for the first team players you wish to be available for reserve games. This will allow for the first team players to stay fit and match practised. You can check out what past club stars and favourites are doing now by clicking the 'Where Are They Now' option from the 'Best Eleven' screen. You can ask your board to relay the pitch if it has fallen into a poor state. If your club have not been packing out the stands, the board will consider allocating a match a 'fan day', where offers are made to allow fans into the stadium cut-price. When setting club competition bonuses, a low bonus may save the club a lot of money, but it may also upset or demoralise your players. A forward arrow on the tactical screen indicates a player has been instructed to make forward runs often. Consider the player's positional responsibilities and his level of fitness when making these instructions. Please note that this is only applicable when using the 'Classic' Tactics mode. When joining a new club as Manager, staff who were at the club before you joined will always accept 'Mutual Termination' of their contract. Frequently altering the squad status of a player risks unsettling him and may make him unhappy. Players aged 24 and above are less likely to see dramatic improvements to their attributes through training or natural progression. Goalkeepers will generally peak and enjoy their best footballing years between the ages of 31 and 35. Defenders will generally peak and enjoy their best footballing years between the ages of 27 and 32. Midfielders will generally peak and enjoy their best footballing years between the ages of 27 and 32. Strikers will generally peak and enjoy their best footballing years between the ages of 26 and 31. Physical attributes decline naturally and sometimes dramatically towards the end of their playing careers. You can manually balance the funds allotted to you between the transfer and wage budgets. To do this, adjust the slider on the Budget Adjustment panel in the Boardroom, then click 'Confirm'. This is particularly useful if your board are unwilling to give you any more transfer or wage funds. Football Manager general hints and tips regarding the game, players, pitch size etc.